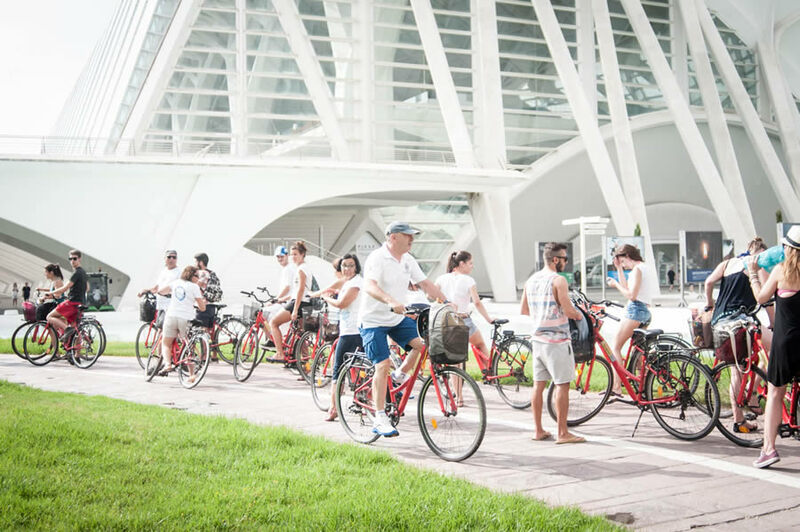 A bike tour is the perfect way to learn all Valencia has to offer especially if you are on a tight schedule and only have a few hours to enjoy our city. Thanks to Valencia's perfect weather, a bicycle is always the best choice! The city offers a wide net of bicycle paths that are safe and easy to recognize. Choosing a bike tour with THE EASY WAY will allow you to discover the main points of the city and part of the Turia park. All our tours are given by official guides. It is available in English, Dutch, Italian and Spanish. You will visit the historical center, Plaza de la Reina, Plaza de la Virgen, the Central Market and the Lonja, and then to the City of Arts and Science to marvel at all of Calatrava's architecture. The Easy Way offers bike tours of Valencia with official guides. The bike tours are available in Dutch, English, Spanish and Italian. Children may take part as long as they come with an adult and can use a normal size bike. For more information fill in this contact form. We will contact you regarding all the information requested. If you would like to make a reservation, let us know which day, how many people and the language you prefer and we will take care of the rest. The bike is included in the price of the tour. You may also use it after the tour.